For a long time I’ve been a summertime white Lillet fanatic. Over ice and sitting on my deck. It’s quite an old fashioned apéritif. This was confirmed by my friend Frantz who informed me that it was also a favorite of his Grandmother’s…pffft…so, I guess that just makes me timeless. In an effort to modernize my apéritif habits, I’ve lately been sipping Virginia Vidal Blanc, but not just as an apéritif. At one of my dinner parties, I served Old House Vineyards 2009 Vidal Blanc with a grilled curry shrimp, as an appetizer. I even had Damien Blanchon, Old Field’s winemaker, grilling the shrimp for me. The slight sweetness of the Vidal Blanc and spicy curry was a good combination, but of course, I have my critique. And that is that I should have simmered the shrimp in the curry sauce, vs. marinating it and then grilling. For the simple reason that it didn’t have enough spice. I use Patak’s Curry Paste, which I buy at Cost Plus World Market. It is really a simmering sauce and now I understand that is how the spice and heat develop, when I’ve previously used it. So, next time I will let the curry paste simmer (add a bit of water) for 20 minutes and then put in the shrimp for 5 minutes to cook. I bet it will then have the spice that I’m looking for. The apéritif that evening was the Janisson et Fils ‘Bleu’ Champagne. It was a gift from my friend, Pamela Margaux of Margaux & Company. This champagne is divine. Brilliantly fresh with subtle fruit and flower characteristics. 50% Pinot Noir, and 50% Chardonnay. The main course was a Grilled Marinated Flank Steak and a Creamy Potato Salad with Lemon and Fresh Herbs. The marinade I used has become my favorite, and makes an inexpensive cut like london broil or flank steak sing. This was paired with King Family Vineyard’s 2007 Petit Verdot (sold out, you’ll have to wait for the 2008). The rich, dark fruit of the PV paired beautifully with the steak. The marinade makes a difference, and you will understand when you click through below, to the recipe. Of course, one bottle wasn’t enough, so we also opened a bottle of Old House’s Bacchanalia, a blend of Cabernet Franc, Chambourcin and Tannat, for the cheese course. Dessert….one of my famous cakes! A Mascarpone-Filled Cake with Sherried Berries, paired with a Prosecco. 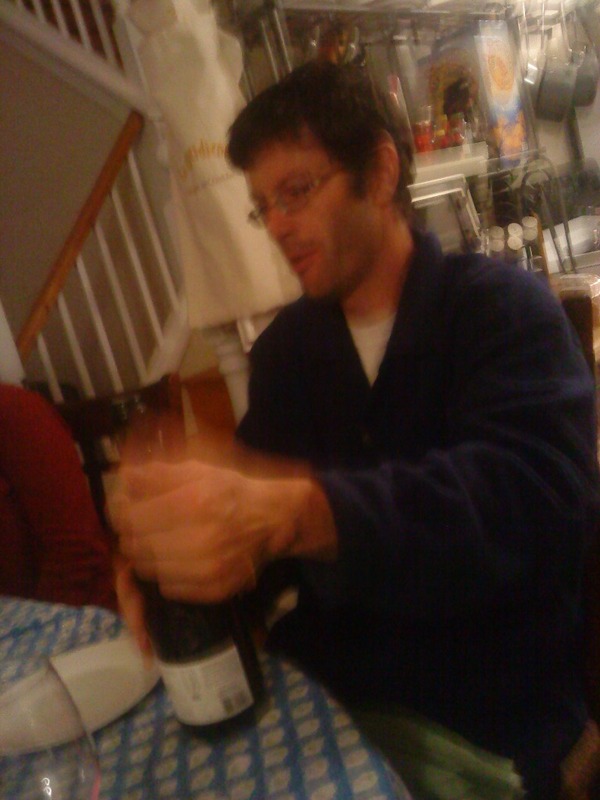 Frantz Ventre opening the Prosecco! And then we finished off with Old House’s Chambourcin Port…..ahhh, a perfect evening! I am forever apologizing for the quality of my photos….so, why should now be any different!! My other dinner guests: Katy Bradley & Damien Blanchon, Jenn & Benoit Pineau were not done justice by my very blurry pics. Never mind….I’ll get the hang of it someday! Let me know how you like the recipes…and enjoy! Granted there are many “old houses” in Culpeper, but only one houses a vineyard and winery with a talented, young winemaker by the name of Damien Blanchon. As I drove up to the stately farm house of Old House Vineyards, I was brought back in time, and as Damien led me through the tasting room and private event dining room, both with fireplaces, the ambience of the exterior architecture continued within. It feels like a B&B, and in fact they do have some rooms to let, if you are attending a private wine dinner in the dining room. 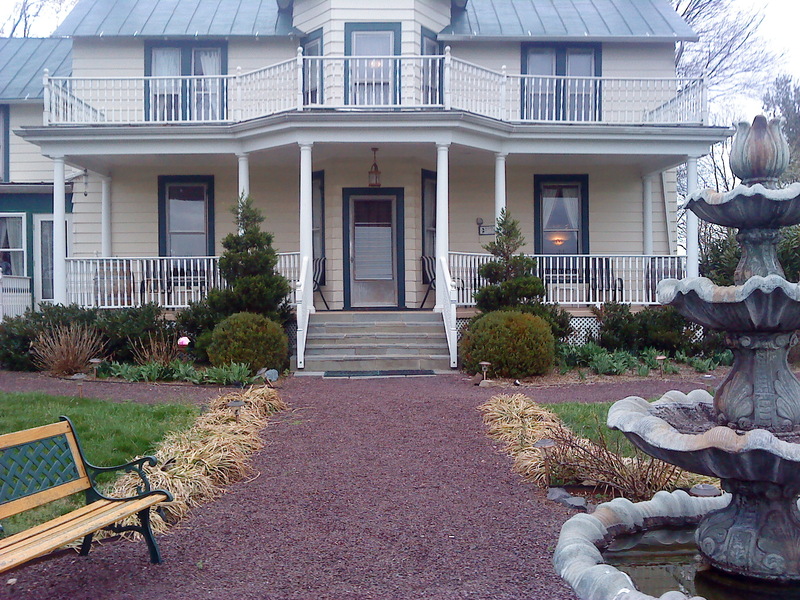 It is marvelous that owners, Pat and Allyson Kearney, decided to keep the rooms as they were. Just some painting and floor refinishing, and what they created is a most inviting and charming series of tasting areas. I can only imagine that it is next to impossible to get people to leave! Granted, I am a sucker for classic old farm houses with big sweeping porches, dark wood mouldings and fireplaces. I just wanted to move in! And combine that classic homey ambience with fabulous wines and a picnic lunch. Damien told me that Old House has 22 acres under vine and he only uses Estate grapes in the 3,000 case production. Planted in the vineyard is Chardonnay, Vidal Blanc, Chambourcin, Cabernet Franc, Cabernet Sauvignon, Petit Verdot, and some newly-planted Tannat, not yet in production. BTW – Tannat is a main varietal from where Damien hails from in Peripignan, Southwest France. Born into a family of viticulturists, Damien started his education in his Grandfather’s vineyard. He then went on to receive his degree in viticulture and enology at the College of Agriculture LEGTA Charlemagne in Carcassonne. Coming to the United States to make wine was a decision led by his desire to experiment with different growing conditions, varietals and the freedom to blend any range of varietals that he so desires. The first wine we tasted in the cellar was the ’09 Vidal Blanc Clover Hill. Aged in stainless steel and with a malolactic fermentation this wine sang of pear on the nose. Fresh and lively, it is the dry VB of the portfolio. The first Chardonnay ’09 was barrel femented in a neutral barrel and is resting ‘sur lies.’ Damien also stirred the lies to prevent oxidation, and then did a malolactic fermentation. So you can imagine the roundness on the palate, yet acidity bounced in at the back end. The second Chardonnay ’09 is aging in a ‘toastier’ barrel and that showed in a nice way. These Chards will age for one year in the barrels. The Cabernet Franc ’09 is bright, light and fruity, and well-balanced. It will be a great picnic & BBQ red. Chambourcin ’09 is blended with some Cabernet Franc and is just wild strawberry fruity! It reminded me of picking wild strawberries in the field behind my childhood home in Maine. The second Chambourcin ’09 went through a cold soak and longer maceration. This will be used in the Bacchanalia blend….a favorite of Old House’s customers. The Late Harvest ’09 Chambourcin grapes were immediately refrigerated, then de-stemmed and put into a stainless steel tank, and is now aging in a barrel. I really like red dessert wines and this is soooo South of France! And even for the summer, it would be great with a cheese course of Blues and Cheddars, oh throw in some Epoisses, too. Ahhh…the Petit Verdot ’09….I am becoming a fan of this varietal as a single-varietal wine. This PV is still in a fresh, young stage and showing good acidity. PV is a grape that delivers a good level of acidity, another good reason for its blending capacity, but works in its favor as a single varietal. This wine will be aging for another year. In the meantime, The Petit Verdot ’08 is a classic inky, full bodied PV that will be released in the Bacchanalia blend this summer. Damien is still deciding on the final blend, but it may be something like 50% Petit Verdot, 30% Chambourcin, 25% Cabernet Franc…you heard it here first. The ’09 Vidal Blanc Late Harvest has been fermenting since December and has about 3 more weeks. Then it will be racked and held in a stainless steel tank; then racked again and transferred to barrels to age for maybe one year….for as long as Damien decides it needs to. He is planning to release it towards the end of 2010…. maybe in time for Christmas. I have never tasted a Port made from Chambourcin, and I was surprised to see that it’s amber color. 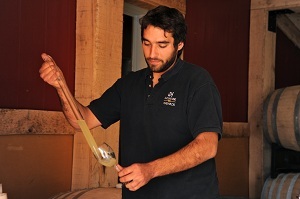 The ’09 has brandy added to stop the fermentation….and that is called ‘mutage’…en Français. This is a very South France style, Vin du Naturel. Two barrels will be aging for 3 years….oh, take off that frown, because Damien is aging another batch for 1.5 years, that of course, will be available sooner. Besides, the ’08 Port is available in the tasting room. Although, I can’t wait for that 3-year aged batch…let’s see 3 years aging, bottled, released oh sometime around 2013. Yikes!! Considering the Ancient Mayans predicted total earthly devastation in 2012…pffft, never mind. I shall remain positive that we will be imbibing in this nectar. I don’t think even the Ancient Mayans prediction will convince Damien to decrease the time of aging. Current Releases – no more teasing of wines to come. These are now available! ’09 Vidal Blanc, this is the semi-sweet VB of the portfolio. Damien did a skin maceration with this and delivered a 3% Residual Sugar. BTW – it’s fructose sweetness vs. saccharin, which would result from adding sugar. Just thought you might want to know that. The fermentation was stopped at 12.3% alcohol, so even though it’s semi-sweet wine, it’s not any higher in alcohol. Yes, that is a license to drink more. I’m planning to try this wine with grilled shrimp that I’ll marinate in a medium-spice curry paste, as a first course on greens. Vidal Blanc is aromatic and expressive, and it’s semi-sweet nature should be an interesting pairing with the spicy shrimp. 2007 Bacchanalia, a blend of Cabernet Franc, Tannat and Chambourcin. I undersand why I had so many customers asking for this when I was on the floor at Frenchman’s Cellar in Culpeper. A bold wine, but that strawberry thing with the Chambourcin softens it a bit and brings some female to the wine. Along with the earthiness of the Cab Franc and tannic blackberry of Tannat in the blend, it really paired nicely with a Chicken Marsala I recently made, using Crimini mushrooms. The richness of the Marsala wine sauce stood should-to-shoulder with this wine. 2008 Port – this is the older brother of the ’09 that is still aging in a whiskey barrel. Again, Damien used Chambourcin and it really works well for Port. Perfect with a cheese course, or chocolatey dessert. I can see just sipping it on late wintry evenings. 2006 Petillante, which translates as “bubbly, sparkling.” This is a yeasty, biscuit-like sparkling with a long finish. This elegant Sparkling is made every two years, and only 100 cases. As you may know, it is a rather tedious endeavour to make premium Sparkling in the ‘methode traditionelle” style, hence the price tag generally. But at $35 for Petillante, it delivers for the price. I can see this with foie gras as a first course; or with a lobster dish. Today, I came across a suggested pairing of Dom Perignon with BBQ ribs. So, go for it! 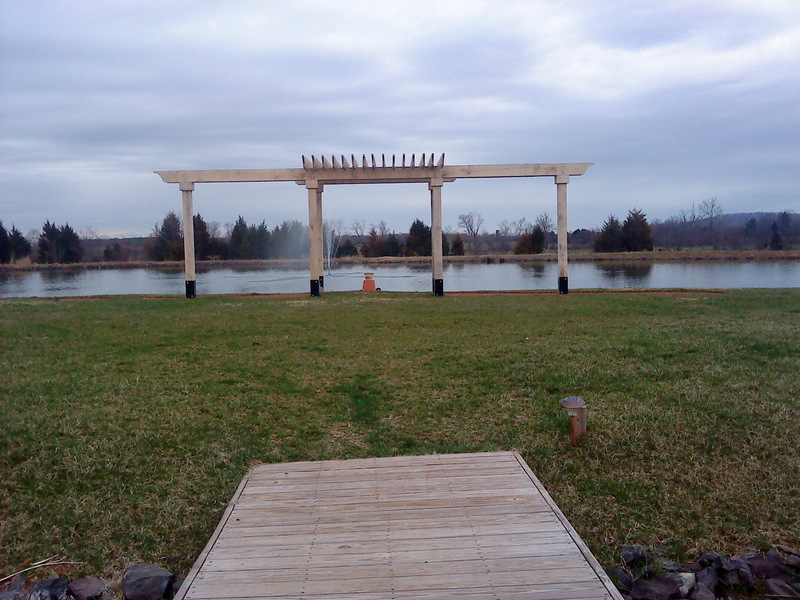 The biggest news from Old House is the introduction of their Lake Pavilion, an events venue that overlooks the “The Island,” which is perfect for wedding ceremonies. This is the newest and most unique wedding venue addition to the region. Imagine….dial in to your romance gene…strolling across the foot bridge over to the small island to say those vows. The Lakeside Pavilion is still having some final tweaks done, but will be ready in time for this season. As an event planner in Napa and on the East End of Long Island, I’ve done lots of weddings in beautiful locations, and Old House Vineyards certainly delivers a top notch site that offers a gorgeous view and setting without any puffery. Check out their upcoming winery events. Some winemakers are sort of like jet setters. Think about it, they jet from one beautiful wine region to another to work at wineries and vineyards, so they can broaden their winemaking skills. No wonder wine enthusiasts dream about being a winemaker, or starting a winery. But, at the risk of bursting your bubble, these winemakers and the vineyard managers, toil and stress over growing conditions, sometimes inheriting a not-so-well-planted vineyard, negotiating big equipment in small spaces; not to mention really fun stuff like pruning in 0-20˚ winter weather with the wind howling. Yep, it’s true…the wine business isn’t all about charming, or Taj Mahal-like tasting rooms, or wine dinners in elegant restaurants. It’s a lot about farming and the challenges therein. I am droning on about this a bit, because as I do these cellar visits with winemakers, and tell you about them, I am hoping to increase your appreciation of what it takes to make good wine. A lot of guts and not always much glory. 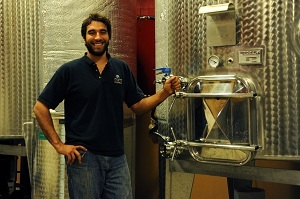 The well-travelled winemaker who inspired this blog is Burgundy born and raised, Sébastien Marquet, at Doukénie Winery. The Winery is owned by the Bazacos family, who first planted a vineyard on the property back in the ’80s. The 4,000 case production enables Sébastien to also fulfill the roles of Vineyard Manager and General Manager, in addition to winemaking duties. Before we went into the cellar to taste, Sébastien gave me an overview of the vineyards….because any winemaker of worth will attest to how good wine is first made in the vineyard. They have 12 vineyard acres on the Estate with clay and chalky soils, and 26 acres Sébastien also oversees in Fredericksburg, where the soil is sandy. We ventured into the cellar, where I was reminded of how winemakers organize production in small spaces; similar to chefs who produce an amazing array of dishes out of incredibly small kitchens. Not that Doukénie’s cellar is any smaller than most. But, as in the case of most, especially during harvest it requires moving big tanks and barrels in and out and around. Some barrels are still aging wines from the prior vintage, so space has to be maintained for them. Winemaking is truly a crossover of left and right brain activity. We started with a Chardonnay 2009 – aging in a 10 year old French Oak barrel, sur lies. I’ve mentioned this before, but in case you haven’t read all of my blogs (hard to believe! )… sur lies is the term used when winemakers choose not to rack the wines after the first fermentation, and leave the wine to lie on the yeast. This process gives a fuller body to the wine, and is often opted for with white wines instead of doing a 2nd/malolactic fermentation; but sometimes a winemaker may choose to do both. It’s a matter of the style that the winemaker is going for. Even at this stage, wines will show their varietal characteristics on the nose and palate. We did a tour of the Chardonnays and all exhibited classic Chardonnay pear, riper apple (unlike the green apple of Chardonnay that remains in stainless steel). Also the difference in barrels, related to age, toast level (light to heavy), and country/region of origin, will all contribute something unique. The blending of all is a result of the winemaker’s creation, their own recipe, as it were. Chardonnay 2009 – aging in a 2-year old French Oak barrel. The fuller palate on this wine, because of the newer barrel, was immediately apparent. Just as wines are organized in order of style for tasting purposes, the same applies in a cellar tasting. Chardonnay 2009 – aging in Hungarian Oak, which can impart pretty strong aromatics to a wine. A smoky aroma was prevalent and Sébastien intends to blend this barrel with Chardonnay aging in French Oak. This way the final blend of Chardonnay will have just enough of the Hungarian Oak characteristics to complement the Chardonnay from other barrels. Chardonnay 2009 – aging in a new French Oak barrel. Yes, a bigger, longer finish. Chardonnay 2009 – aging in an Acacia barrel. If you’re familiar at all with Acacia, then it will not surprise you that this barrel imparts floral characteristics immediately, on the nose. Chardonnay 2009 – from the Estate vineyard. These vines are 16 years old and this Chardonnay stood out with richness and butter (without a 2nd fermentation) on the nose and palate …but, like fresh dairy butter. Not that stuff that impersonates butter found in the grocery store. I usually don’t like that butter thing that happens in Chardonnay, but this was not that. This was a good thing. Even with oak aging, a good winemaker will always maintain the fruit’s integrity and all of the Chardonnays (well, in fact all of the wines I tasted) did just that. Many of us have become picky Chardonnay drinkers, so I am always thankful when I taste the future of a final blend and know that this is a Chardonnay I will happily uncork! And it probably helps that Sébastien learned to crawl in his grandfather’s Burgundy vineyard, followed by boarding school in Burgundy where viticulture and oenology was the focus of studies from the time he was 13 years of age. Years making red and white Burgundies in many of the top regions such as Pommard, Volnay and Meursault goes a long way in making a Burgundy-like wine. We then went up to the ‘club members only’ room and tasted several of the current releases available in the tasting room. Let me just say that I love that ‘club members only’ room. It’s charming, with lovely views and it makes you feel special without being stuffy. Sauvignon Blanc 2009 – this wine had just been recently bottled, so it will be released soon. I had a chuckle when re-reading my notes, because I had actually written ‘Sancerre” instead of Sauvignon Blanc. As I’ve previously written, my favorite Sauvignon Blanc is from the Sancerre region of the Loire Valley. So, obviously, I really like this one! The nose was tropical and floral, acidity with a touch of roundness on the palate…and where did that floral come from? Well, Sébastien has aged just a bit of it in an Acacia barrel. Perfection! This could be my summer House White! 2009 Mandolin – a lovely blend of Traminette, Seyval Blanc and Vidal Blanc. A nose full of lychee, apricot and citrus flowers. And with just 1.5 Residual Sugar, the intense aromatics of this wine is about the fruit, not added sugar. A long finish and balance that has acidity and sweet aromatics in perfect harmony. A divine apéritif, and dinner wine for spicy grilled fish. 2007 Vin de Paille – a Riesling dessert wine. Vin de Paille translates to Straw Wine. And why would anyone think Straw Wine sounds appetizing? Well, when you hear what it stands for…you’ll get it. It’s a term for this style of wine, where the grapes are laid out on straw to dry to develop concentrated sugars. Plus, the grapes had some botrytis, which is that good bacteria that forms on grapes in wet, accompanied by humid, weather. Now, of course, the botrytis is only a good thing if you’re planning on making a dessert wine. Otherwise, you don’t want to see it spreading like mad on the clusters. This is a rich, honeyed wine with balance of richness and slight acidity, florals and spice. My peach and blueberry clafoutis, or that angel cake I make (from scratch, don’t you know) with macerated berries; Blue d’Auvergne cheese…any and all would work very nicely. 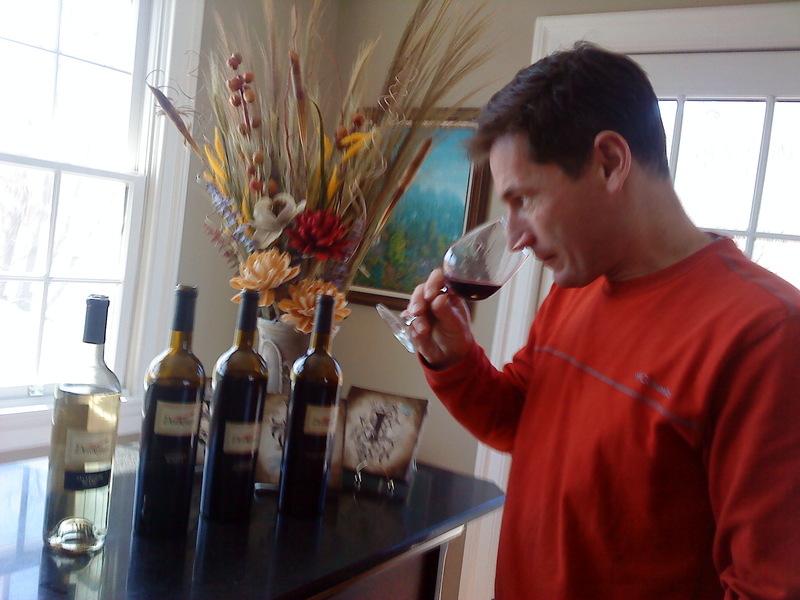 On to the reds….Petit Verdot 2007 – Silver Medal from the San Francisco Chronicle Wine Competition. This unfiltered wine delivers the inky, black currant of Petit Verdot, aged 24 months in French Oak. I see why several winemakers and some owners, see Petit Verdot as potentially ‘the’ leading red varietal for Virginia. This one has a great earthiness and although it still shows some tannin and as Sebastien said, “It’s still angular, but will continue to smoothen in the next 2- 5 years.” So this is a wine for your own cellar. Petit Verdot is pretty singular in regard to it’s fruit characteristics, but even so, when in the hands of a good winemaker, one doesn’t feel cheated. The varietal can still deliver a satisfying wine in every way. Vintners Reserve 2007 – Cabernet Sauvignon 55%, Merlot 20%, Cabernet Franc 15%, Petit Verdot 10%. A classic Left Bank Bordeaux-style blend. Three words leapt to mind when I tasted this wine – perfection, bold and rich. Everything was spot on with this wine. The lively tannin makes it another candidate for your wine collection. It is very satisfying to experience such gorgeous wines being made right here in Virginia by winemakers who have chosen, out of all of the higher profile regions they could be in…to be in Virginia. For Sébastien, and winemakers like him, the opportunity to be able to focus on a smaller production of high quality wines far outweighs being a cog in the wheel of a big name, high volume winery in a higher profile region. Score for Virginia! Doukénie Winery has lots of events, like Blending with the Winemaker…gotta love that, and culinary classes! I suggest you put them on your weekend wine tasting schedule. And the wines are outstanding across the board, so think about becoming a wine club member and get entry into that private tasting room. Granted, I am getting ahead of the game here by blogging about Evan Goldstein’s upcoming book Daring Pairings, http://bit.ly/cJMwM3 since it will not be available until April 1st. But, it will be here before we know it, so put it on your ‘must have’ list, now! One of the chefs featured is Dan Barber, of Blue Hill fame in NYC and his Hudson Valley outpost, Blue Hill Stone Farm. 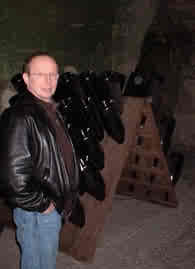 In 2003, Dan invited me and the winemaker I worked with at the time, Charles Girard, to dine at Blue Hill as his guest. Dan was a fan of Charles’ 2000 Cabernet Franc which he liked to pair with his infamous Short Ribs. Admittedly, I don’t remember the menu exactly, so I can’t regale you with details (it was many dishes)….but, I will say that even without specifics I remember it as one of the most enjoyable meals ever. After dinner, Dan invited us into the kitchen, which was so small we were aghast at how Dan and his team produced such exquisite and varied dishes from such a small area. Great chefs do great things in small spaces. Dan has always been a leader in sourcing local and cooking seasonal, and provides his restaurants with produce from his Great Barrington, MA farm. The specialty of that dining experience was beyond the amazing flavors and textures of the food. It was also special because Dan’s accessibility, passion and generosity made it so. When you are in NYC, or Hudson River Valley, be sure to make Blue Hill a stop….you will be very happy you did.